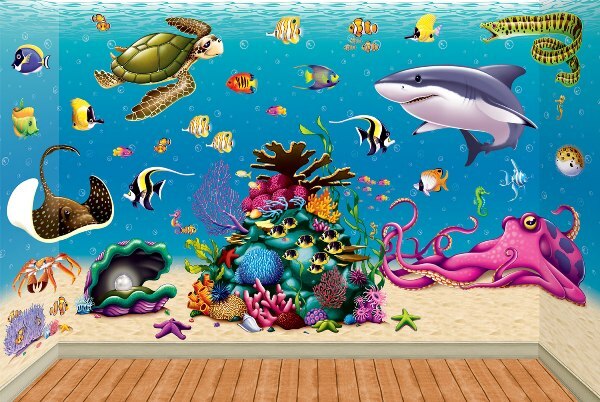 Make decorating a breeze with this Under the Sea Insta-Theme! Go on an underwater adventure with these fun sea creature decorations. All of our most popular under the sea decorations have been conveniently sorted into one category, so everything you need for the ultimate under the sea party is right here! Use this under the sea theme for a variety of occasions - like an under the sea prom, or under the sea birthday party. We have decorations to suit all your under the sea party ideas! Start decorating with an Undersea Backdrop, just hang it from your walls and instantly transform your living room into an underwater oasis. Then, make your decorations come alive with our Sea Creature Props and Mermaid Props! Cut out the plastic fish decorations and tape them to your backdrop. Your guests will feel like they're right in the middle of an underwater habitat! Don't make decorating a chore - make it quick and easy with this Under the Sea Inst-Theme! No matter what kind of backdrops or other party supplies and decorations you're looking for we've got you covered right here! So party with us! We're PartyCheap.com and we know how to party! You can create a unique underwater theme by simply attaching the Insta-Theme backdrop, border rolls, and add-on props on to any wall. You can use tape to hold up the backdrops and props on to each other and the walls at your location. This is perfect decoration for sea party themes or dances. You can even use this to feel like you are at the aquarium with how large the backdrop is. The Insta-Theme backdrops are 30 feet wide and can be cut to fit your room, hallway, or banquet hall. Check out our nautical decorations for more sea party theme ideas and props that you can add.